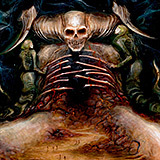 Even if you haven’t heard any of Entrails material before hitting play on Obliteration, one look at this album’s cover and the band’s logo and you’d be pretty hard pressed not to assume a little Entombed worship within the album’s 42 minute run time. And it’s certainly there, but the ten songs here aren’t stale recreations of a sound long past. There’s a certain demeanor to Entrails’ material that feels lively — well, reanimated flesh lively — and infectious. “No Cross Left Unturned” is a rager of a song and sets your head banging like there’s no tomorrow. A solid D-beat rhythm peppered by barbaric blasts mingle with crusty, buzzing guitars and what now turns out to be Jocke Svensson last vocal performance for the band. The combination results in one hell of a song, that unfortunately sees the band peaking very early in the album. “Epitome of Death” sees a bit of a Hail of Bullets style riff to open up what turns out to be a chugging, groove-fueled and grisly affair. The rolling “Beyond the Flesh” is a capable song that punishes relentlessly before you dive head first into the rifftastic “The Grotesque” which slows things down a bit to allow that previous effort to fester and rot appropriately before amping up the pace. And this is where things get a bit unsteady for Obliteration. “Obliterate” and “Skulls’ are both your standard, run of the mill buzzsaw death metal that really don’t offer too much. Thankfully, that lull is punctuated by the moody and brooding “Midnight Coffin,” a song with a solid groove and malicious overall vibe. The remaining three songs on the album pretty much just carry you to the end in a rather uninspired series of tracks. “Abyss of Corpses” has an interesting bit of doom riffery going on, but for the most part the album ended with “Midnight Coffin.” All in all, Obliteration ain’t a bad album. It’s not Entrails best effort to date by any means, but it’s not completely terrible either. There are a few songs here that may be worth your time.